Day 5 of our east coast adventure had a three point plan. We wanted to explore the Acadia National Park, eat a popover at the park's Jordan Pond House and take a trip on a real lobster boat. The park is gorgeous and you could spend days hiking and exploring. The combination of thick, green forests and rocky beaches is an incredibly beautiful combination. Think Smoky Mountains surrounded by ocean. While we were disappointed to find out that we were not going to be seeing a moose in the park (a ranger told us to give up on that notion), we did manage to spy a few of the park's inhabitants. We saw a green, speckled frog sunning himself on a spotted log. Okay, this one we could have done without! I don't know what kind of snake it was, but we side stepped carefully around him. Finally, we saw this little fellow guarding the trash can. We loved how the lush, green forest runs right out to the rocky shore. This wooden trail out behind the Jordan Pond House seemed like an easy hike. Honestly, it was harder to stay on the planks than it would have been just to walk on a dirt path. I wondered how many people had turned their ankles falling off the edge of the path. We ended our hike back at Jordan Pond House where we were anxious to get our hands on their famous popovers. After our hot walk, we were happy to cool off in the rustic and airy lodge. As soon as we were seated, our server brought out the object of our desires. Let's just say we were not disappointed. The popovers were hot and huge and we could not wait to dig in. They came with homemade blueberry jam and real butter. Of all the things I ate on our trip, this really was my absolute favorite. I dream about these popovers. Sadly, because the popovers are only good hot, right out of the oven, bringing some home with me wasn't an option. If you go to Acadia, make sure to eat a popover at Jordan Pond House. In addition to our wonderful popovers, we sampled a delicious blueberry crisp made with Maine wild blueberries. It came with ice cream drizzled with buttermilk and wildflower honey. Divine! Finally, so you don't think we were just eating sweets, I got a plate of smoked salmon with sliced red onion, capers, boiled egg, drizzled with crème fraîche. It was yummy! Following our afternoon tea, we drove around the park some more, enjoying the natural beauty of the island. The views from the highest point in the park, Cadillac Mountain, were stunning. We only saw a small portion of the more than 47,000 acres that make up the park, so we were sad to leave, but we had to get back to Bar Harbor for one more Maine adventure. We had a date with Lulu Lobster for a ride on a real Downeast style lobster boat. After we purchased our tickets, we got on our boat and met the captain of the Lulu and our host for the trip, Captain John Nicolai. Captain John was everything you would expect and want as a captain of a lobster boat. The crusty seaman not only looked the part, he was witty and entertaining and a great teacher. We learned about lobsters and lobstering, as well as conservation and history. One highlight of our trip was visiting Egg Rock Light in Frenchman Bay. Other than the beautiful and unusual lighthouse on Egg Rock Island, we were delighted to see hundreds of seals lounging on the rocky island. A bald eagle stood right in the middle of the seals, standing guard. 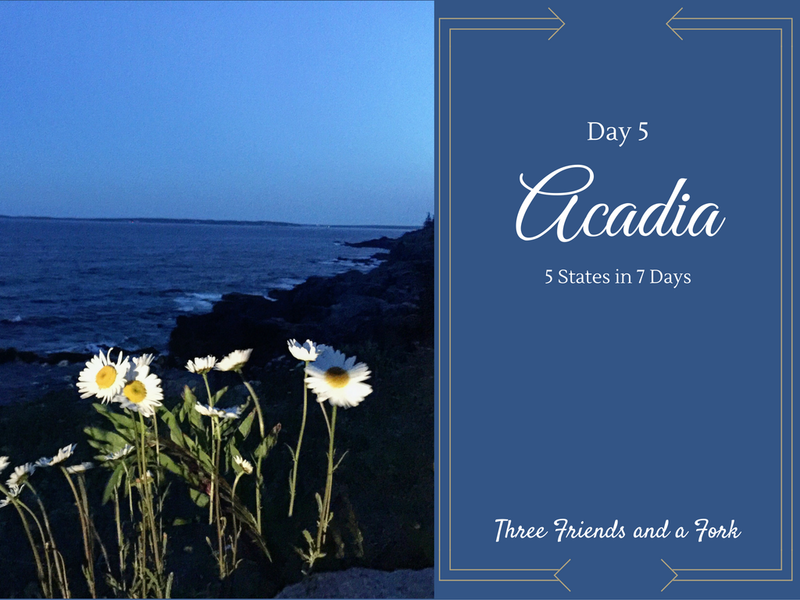 By the time we finished our boat trip and got back to Bar Harbor, the day was almost done, but we had miles to go before we would sleep. We said goodbye to Maine and drove back through the White Mountains of New Hampshire and on to the Green Mountains of Vermont. We laughed and had so much fun, we forgot to be exhausted until we found a room in Waterbury, Vermont and finally dropped into bed in the wee hours of the morning. Tomorrow, Day 6: Ben and Jerry's, Woodstock, Vermont, Woodstock Farmer's Market and back to Rhode Island. In the meantime, Three Friends and a Fork give 3 Delectable Yums UP to Jordan Pond House and Lulu's Lobster Boat.